A longtime advocate of universal paid leave legislation, TCG President Daniel Turner is proud to join with the National Partnership for Women & Families and other business leaders in launching the Businesses Advancing National Paid Leave website, www.advancingpaidleave.org. This new website showcases why embracing a national paid leave program is good for businesses, families, and the country. The website also provides concrete examples of how companies can work to advance a strong national paid leave standard. The Family and Medical Insurance Leave (FAMILY) Act is a commonsense paid leave solution that is affordable for workers, employers, and the government. The FAMILY Act would provide up to 12 weeks of paid leave for working people to care for a new child, sick loved one, their own serious medical issue, or certain military caregiving needs. Today in the United States, just 17 percent of workers have access to paid family leave through their jobs and less than 40 percent have temporary disability insurance through their employers. Furthermore, the United States is the only developed country that does not offer paid leave for the birth of a child. TCG recognizes this folly and is trying to correct it for our staff and the American workforce. TCG employees — both men and women — get three weeks of paid leave after the birth or adoption of a child. Additionally, the company pays for short- and long-term disability insurance at no cost to the employee. TCG believes a national paid leave plan is a worthy and important enhancement to our society’s employee safety net that delivers real world benefits to employees and their employers. Having to deal with the physical, emotional, and financial toll of illness is stressful enough. Families need to know they have job and financial security when facing extraordinary circumstances, but we need to do it in a way that doesn’t put substantial burden on concerned employers. Not all companies can do this on their own, which is why more than 100 million workers are without dedicated paid family leave through their jobs. That’s why we believe legislative solutions such the FAMILY Act and the Washington, DC Universal Paid Leave Act make sense. 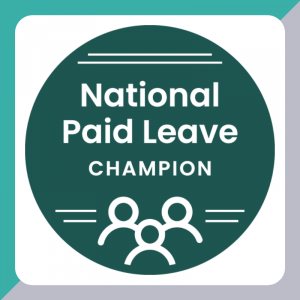 Visit the Businesses Advancing National Paid Leave website to learn more about how you or your company can support paid leave legislation efforts.